Are You a Real Marxist? The Gradual Emergence of Life? Welcome to the SHAPE Journal. In this double Launch Issue we will begin with six sequences of papers on a wide variety of topics. We unashamedly concentrate on Philosophy as the essential and universal approach to human understanding of the world, but, as you will soon see, reject totally its usual academic and remarkably opaque form. Philosophy is too important to be sidelined into esoteric territory for a privileged intelligentsia. It is essential for everybody, yet never so addressed! Therefore, all our Strands (categories), though all part of our conception of Philosophy, will range across a very wide spectrum of disciplines that would usually be placed elsewhere. This initial selection will give an idea of what we will be discussing. Perhaps the most important papers, which commence here, are not what you would expect to find in an academic Journal, but the separation into clearly distinct disciplines is without doubt at the very heart of what is wrong with them. They are usually hermetically sealed compartments, which admit of NO all embracing approach. Well, that essential World View standpoint is precisely what we mean this Journal to be all about. The paper Explanation via Chaos is a thorough-going criticism of a BBC TV programme (High Anxieties) which attempted to explain the World Bank crisis of Autumn 2008 as a result of unavoidable mathematical Chaos, and hence "nobody's fault". 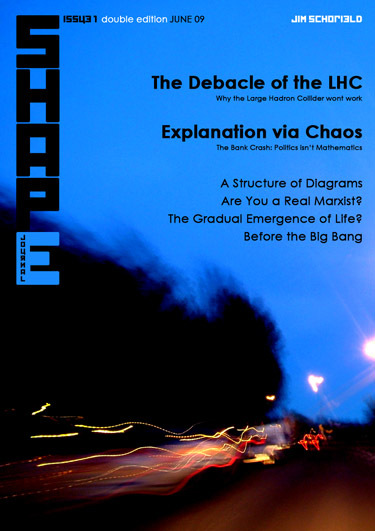 The second major article The Debacle of the Large Hadron Collider was, once again, in response to a "popularising" TV programme on this amazing billion dollar venture, and tackles the by now century-long crisis of these physicists locked into the cul de sac of the Copenhagen Interpretation of Quantum Theory. Four other papers cover topics as far apart as Marxism, the techniques of Realisation via Diagrams, what came before the Big Bang and finally the myth of the gradual Emergence of Life on Earth. Quite a set, I think you will agree!